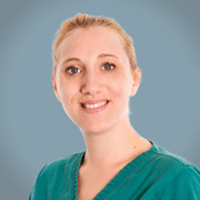 Rebecca qualified as a Registered Veterinary Nurse in 2009, having completed her training at Cedar Veterinary Group in Ringwood. After qualifying, she continued to work at Cedars as a multidisciplined Veterinary Nurse and developed a wide range of skills, during this time she discovered a particular passion for providing gold standard inpatient care and decided to move into referral nursing to develop these skills further. In 2012, she joined SCVS as a dedicated wards nurse and has been fundamental in the establishment of this role. Rebecca has a keen interest in emergency nursing and achieved her Certificate in Emergency and Critical Care (CertVNECC) in 2015. She particularly enjoys nursing the high dependency patients and building bonds with the long term neurological patients.